Lovely 14kt. 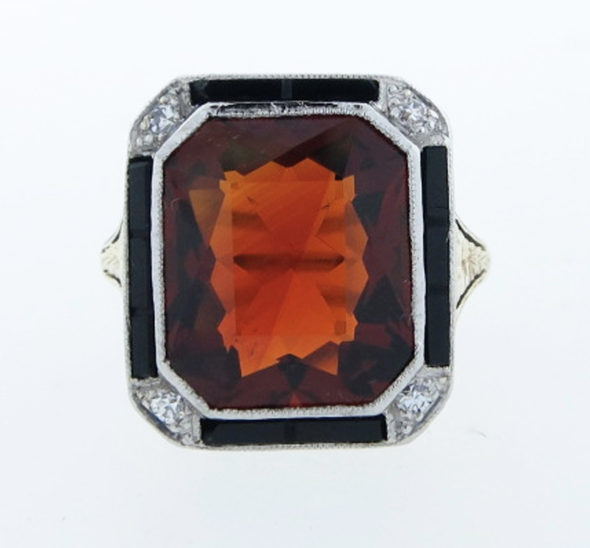 yellow and white gold mount ring with a cabochon garnet center. The surrounding mount is prong set in white gold with eight round mine cut diamonds. 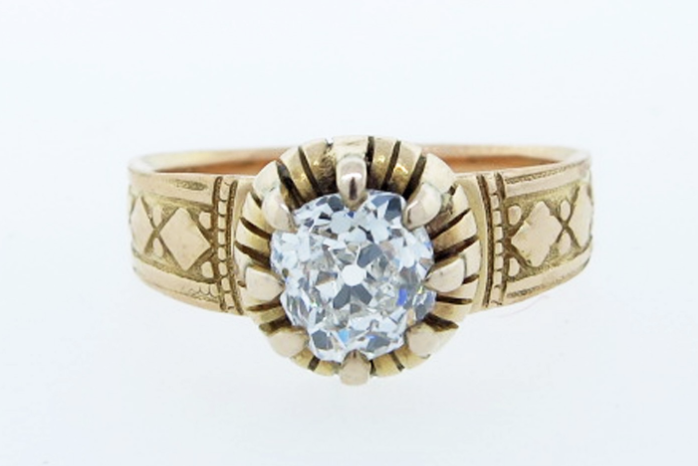 The ring is circa 1920. The ring is size 6 and can be sized. 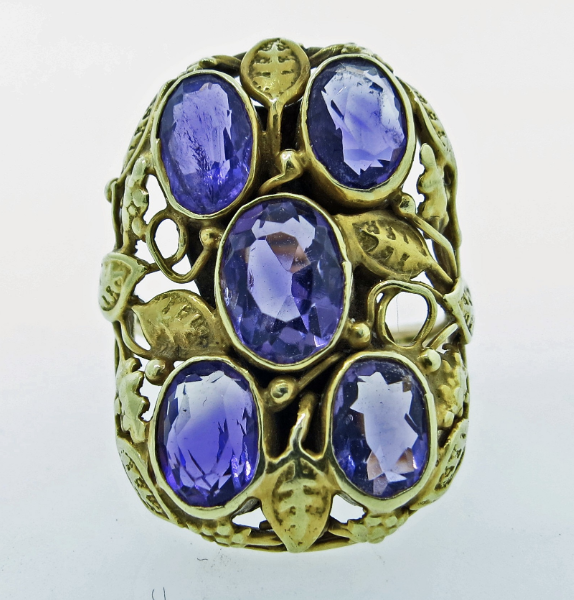 Antique Arts and Crafts Period Amethyst Ring. Beautiful condition originally boxed 18kt. yellow gold articulated necklace, diamond centered locket and earrings sold by W. Langford & Sons Bristol England circa 1880. 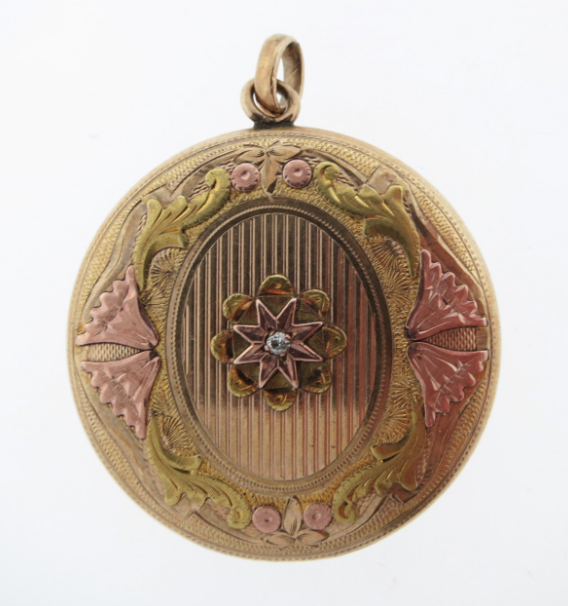 18kt. yellow gold repousse' dragon motif bangle bracelet circa 1900. The dragon eyes are set with cushion cut diamonds. The bracelet will fit most wrists and weighs 56. gr. Lovely 14kt. yellow gold pink and green natural tourmaline necklace circa 1900. 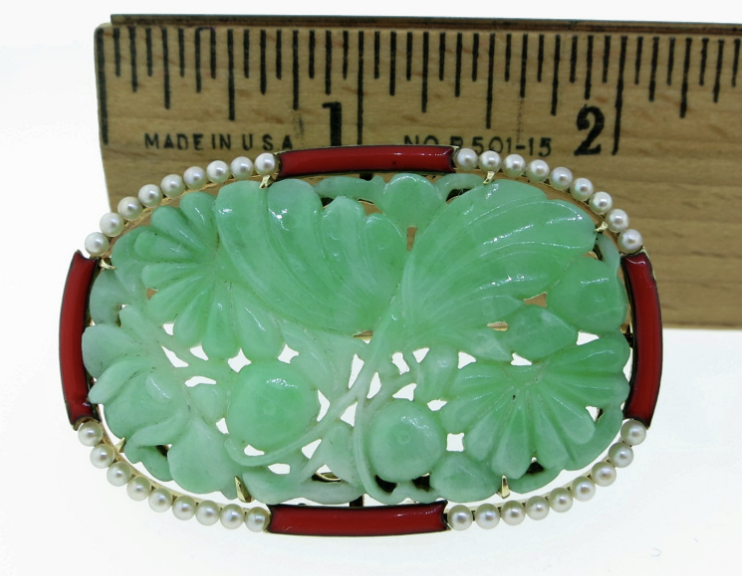 The articulated tourmaline drops measure approx 2 inches in length. Antique pair of 14kt. yellow gold double sided enamel bangle bracelets, each bracelet measures approx 1 .1 inches in width. The bracelets will fit most wrists circa 1880. 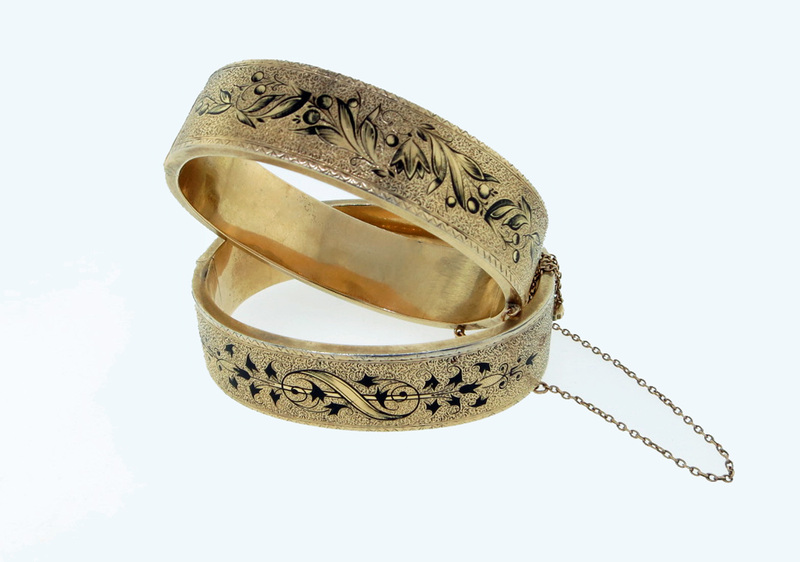 Antique bangle with fine detailed granulation work in 18kt. yellow gold. The center is prong set with a extraordinary round faceted natural blue sapphire weighing approx 1.25 cts. also set with four old mine cut diamonds totaling approx .80 cts. circa 1880. Beautiful open work platinum mount ring circa. 1925. 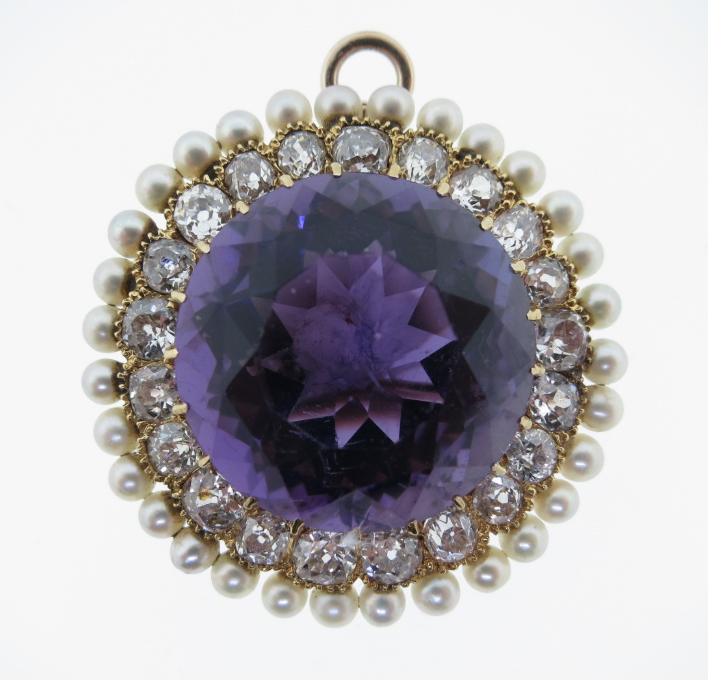 The center is set with a bullet shape natural cabochon sapphire weighing approx 5.0 cts. The mount is set with 28 old cut diamonds totaling approx 1.0 cts. The ring is size 7 1/2. 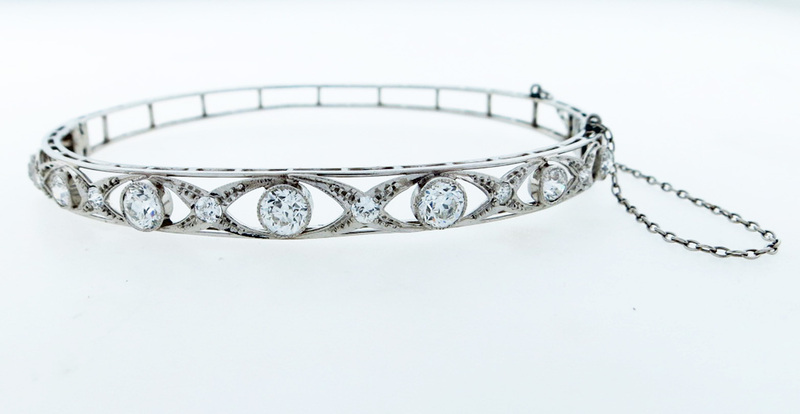 Platinum mount diamond top bangle bracelet made by Allsopp Brothers Newark N.J. circa 1925. The top is bezel set with seven slightly graduating old European cut diamonds and bead set with six round European cut diamonds. Total diamond weight approx 2.0 cts. The bracelet will fit most wrists. 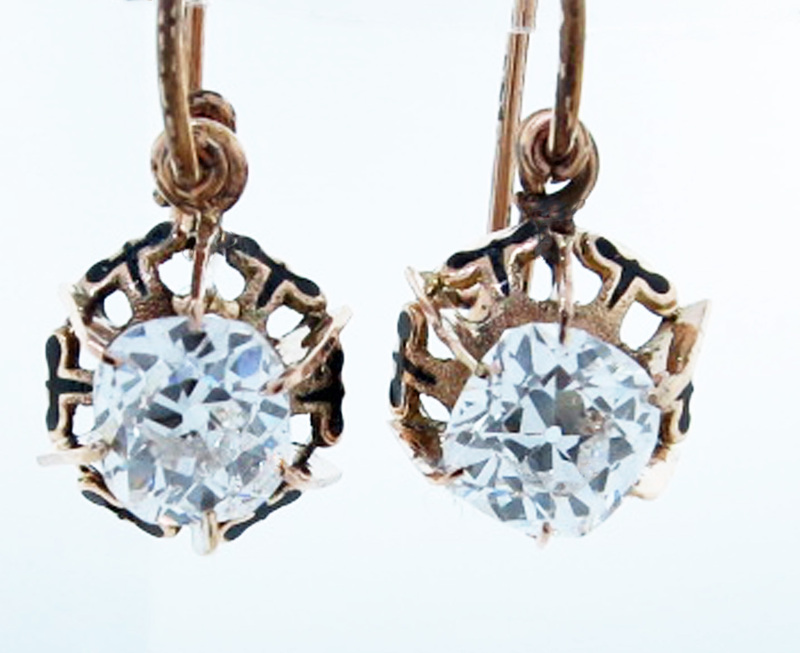 Vintage Victorian pair of old mine cut diamond dangle earrings in handmade 14kt. yellow gold mounts with ear wire closure . Each diamond is prong set in black enamel detailed mounts. Total diamond weight approx 1.77 cts. grading VS clarity H color The earrings were made in the late 1880's. 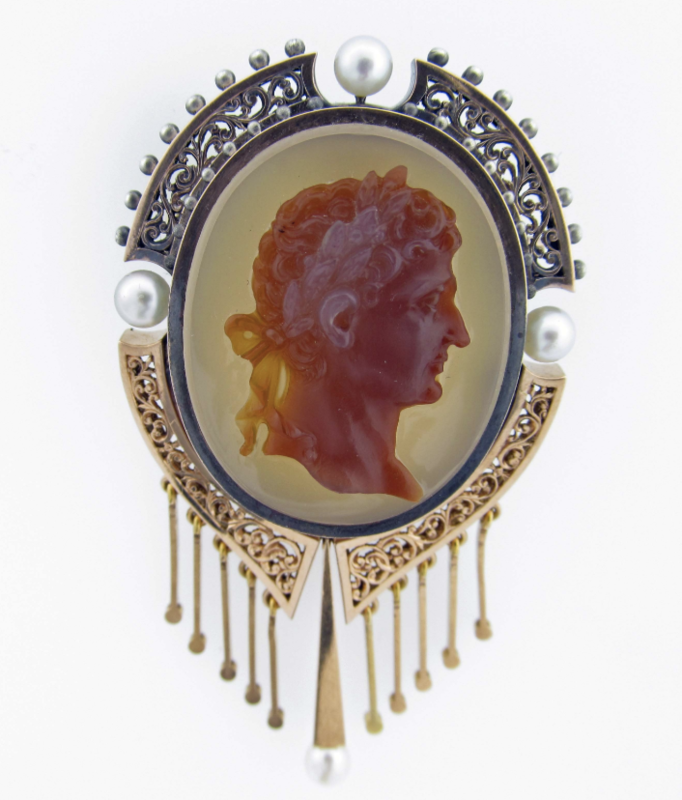 Antique French Agate Hard stone cameo Brooch Pendant in 18kt Yellow Gold. 14KT. yellow gold diamond top bangle bracelet circa 1880. 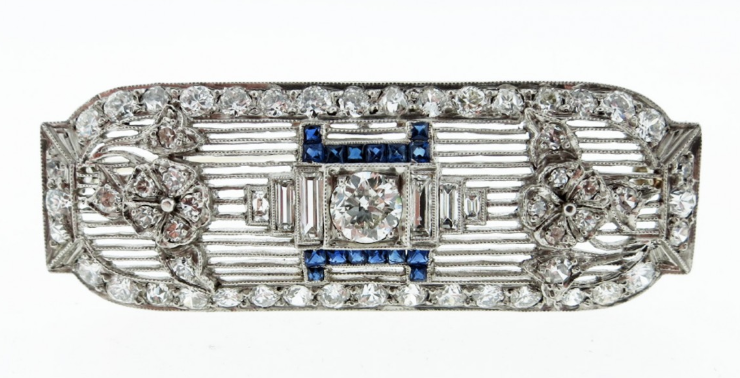 The top is bezel set with five old mine cut diamonds totaling approx 3.25 cts. The bangle will fit most wrists. 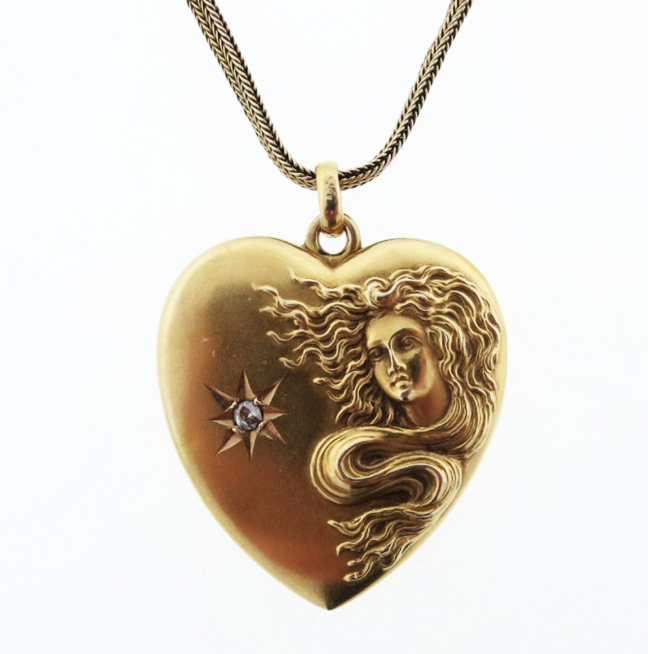 Ladies handmade 14kt. 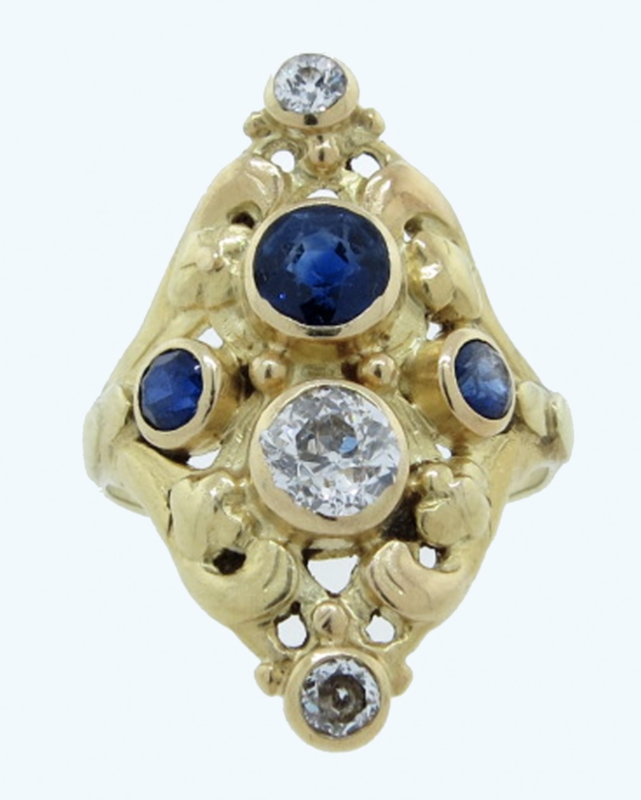 yellow gold Art Nouveau ring circa 1910. The large center old mine cut diamond weighs approx. .50cts. The large old fine natural sapphire weighs approx. .60cts. The side smaller diamonds total approx. .12cts. The side smaller sapphires total approx .20cts. The ring is size 6 1/2 and can be sized. Centennial celebration I4kt. yellow gold intricate finish graduated bracelet circa 1876. The bracelet is bead set with four old mine cut diamonds totaling approx 1.6 cts. two faceted natural sapphires totaling approx .75 cts. and one natural ruby weighing approx .65 cts. 14KT. 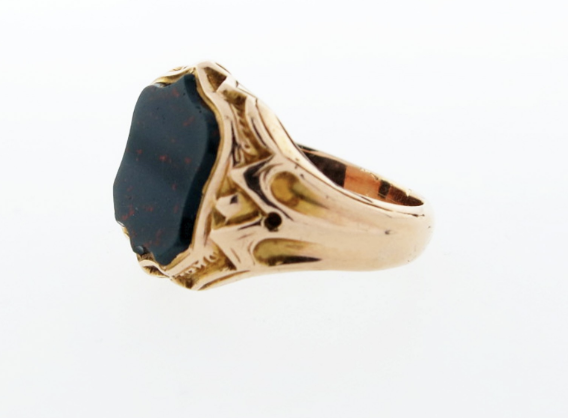 yellow gold dome ring. The center is prong set with a cabochon natural garnet weighing approx 5.0 cts. The mount is bead set with rose cut diamonds in a floral pattern. Beautifully engraved yellow and white gold mount ring circa 1020. The center is bezel set with a rectangular natural golden faceted citrine weighing approx. 5.cts. surrounded with 10 faceted onyx baguettes with four round diamonds set at each corner size 5 and can be sized.